→ Have you been told that you should “work on your presence” and you don’t know what that means? → Or perhaps you’ve been told you have excellent presence and you should continue to leverage it…and you don’t know what that means. → Do you observe other leaders or professionals with exceptional presence and wish you had it too? All copies purchased directly through this website will be personally autographed by Lisa Parker. We are excited and pleased to commemorate the success of Managing the Moment as we have been awarded Best Selling Author by our publisher. Thank you for your continued support of Managing the Moment. Today, executive presence is essential for anyone aspiring to be a better leader, regardless of their level, industry, or job duties. 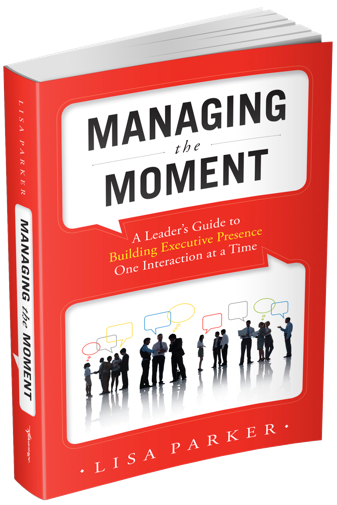 Managing the Moment explores the relationship between effective leadership and one’s style and presence. With humor, insight, and practicality, Lisa Parker demonstrates clearly that every interaction contributes to the way leaders are perceived. She makes the case for how and why leaders should manage every moment. You’ll see that the reason to strengthen your professional presence is not just about you; it’s about your team, your relationships, and the health of your business. Using fascinating and relevant case studies and real-life examples, Lisa Parker takes the mystery out of developing professional presence and offers dozens of dynamic tools, tips and guidelines to create the kind of presence you want to create. Managing the Moment does successfully what few other books relating to lead- ership qualities even attempt: it provides a clear and focused understanding of a quality – presence – that seems too ephemeral and too abstract to ever fully communicate let alone comprehend. Ms. Parker makes the vaporous quality tangible. She does not dumb-down the concept of ‘presence’ or diminish its idealized state or trivialize it by trying to reduce it to some easy-to-swallow idea. Rather, she carefully defines and makes accessible the reality of ‘presence’ for anyone. Readers will gain a great deal from this book and its thoughtful and instantly applicable insights. It should be a welcome presence on many an executive bookshelf. Managing the Moment dissects the intricacies of presence by defining it, answering why you need it, and most important, how you can get it. The book’s analysis of effective communication, building relationships and trust, and managing emotional triggers hits the mark on establishing a baseline for those needing to shape or reshape their leadership identity. How fortunate for us to now have a resource to pass on to everyone in the field of education, especially our emerging leaders. Managing the Moment is a top-shelf resource for me and my team. A leader’s choice in the moment can elevate them in the eyes of others or sabotage a lot of hard work in an instant. Parker understands human behavior and helps leaders apply pragmatic tools to manage emotions, take ownership of their behavior, and grow their business. Lisa Parker is VERY good at what she does. There might be somebody better at it, but I haven’t met them. Building executive presence is a regular topic in my development discussions with staff who have high career aspirations. I have turned to Lisa on many occasions to help members of my team improve their leadership style, their communication skills and their confidence, so it’s terrific that she has put all that knowledge in a practical, actionable book that uses stories and case studies to make the big points. Managing the Moment will be a real hit with leaders who want to build or strengthen their brand. A great executive coach reveals insights about ourselves that enable us to make the most out of our leadership opportunities, and nobody does it better than Lisa Parker. Managing the Moment persuasively argues that successful leaders require Presence with a capital P to stand apart, earn the respect of others and gain the influence they need to lead successfully. Parker offers great advice, compelling case studies, and insightful exercises that will help you hone your skills to best manage your moments and become a stronger leader. What comes naturally to some leaders completely evades others. Why? Lisa Parker uses her years of executive coaching experience to get right down to the heart of the matter: facing the truth about one’s leadership presence means managing behavior to inspire followership. Managing the Moment is an honest view of how one’s leadership style can positively or negatively shape a corporate culture. I am relieved that someone finally put all the wisdom about leadership into one coherent, approachable place. Leaders do not arrive sui generis in our midst. I always believed it was not a mystery why some succeeded and others did not; rather, it was something that could be taught. My favorite parts: page 118, where Parker actually publishes a definition of trust, one of my favorite subjects and a critical one for today’s leaders to confront. It also forms the heart of service quality. Also all of Chapter 6 about presence. In my opinion, this book is so desperately needed particularly by young leaders because I have observed that no one teaches these things to the young anymore. Much to my regret and to our peril as a society, I observed that we have pitted younger and more mature workers against one another. This book may help bridge that gap. Much needed; much appreciated. Parker’s engaging writing style and frequent use of example scenarios make this a fun and easy read. The book is packed with actionable advice and strategies that can have a profound impact on the impression you make as a leader. All those moments really do add up! I have known Lisa for 13 years and have always felt she was the most amazing executive coach, friend and person. I finally got around to reading her book, “Managing the Moment” (yes we retired people are very busy) and I was blown away. It is written exactly as these types of books should be written. It is not lofty platitudes, but very real helpful advice in down-to-earth language. I kept thinking how much better my career would have turned out if I had this book way back when. As it was, I was very lucky to have Lisa along the way to help me when I was having issues. I recommend that everyone, no matter what level or what career/job or even if you are retired, read this book!! Great job, Lisa.